Summer is finally here and we’re helping you get holiday ready from head to toe! With picnics, BBQs, festivals and trips to the beach coming up, we know it can be difficult to be bare-leg ready all the time. Not to mention the unreliable British weather we have to contend with. How do you glide effortlessly from a summer downpour to 30°c heat? Or look glamorous on day three of a festival? Summer brings with it a whole new level of worry when putting an outfit together. But, there’s no need to panic! Here at The Liberty, we have every aspect of your summer essentials to the perfect pair of strappy sandals covered thanks to our 100+ stores. So, there’s never been a better time to stock up on everything you could possibly need to see you right through to autumn. As the old saying goes; fail to prepare, prepare to fail, and like all aspects of live it applies to your beauty regime. There’s no better excuse to relax and enjoy some ‘me time’ than with an indulgent bath. Think candles, music, a glass of wine and a nourishing bath creamer from Naturally Unique (from £2.75). Unlike a bath bomb, the bath creamer moisturises and softens your skin, so sit back and let it work its magic – you won’t regret it and will be left feeling silky smooth. A bath is the best time to pamper yourself with at home beauty treatments, so stock up on some essentials at Boots in The Liberty to set the scene for relaxation. Enjoy your bath even more with L’Oreal Paris Pure Clay Detox Mask (£7.99). Created to draw impurities from your skin, this is the only way to prepare your skin for the ‘no makeup’ look. Put it on before you hop in the tub and leave it on for as long as you require – you will have fresher, brighter looking skin after just one use. Next, slough away dead skin with Grounded Coffee Body Scrub (£15). Coffee Scrubs are so popular in the right now and are an all-natural alternative to microbeads and chemicals. Not only will you smell scrumptious (the Chocolate Orange scrub makes you smell identical to a Terry’s Chocolate Orange!) but there are so many health benefits, you will fall in love with this scrub straight away. Finally, it’s time to lock in all that moisture, and show your skin some love with Burt’s Bees Coca Butter Body Lotion (£9.99) and if you want to fake it until you make it and look like a bronzed goddess, don’t forget to add a layer of St Moriz Fast Self Tanning Mouse (£5.99)! When it comes to summer make up, less is definitely more. When you’re sun kissed and freckled you can really afford to strip back your make look and we’ll be heading to Kiko for all of our make up must-haves. Starting with their Radiance Boost Face Base (£12.90) apply all over your face, then tend to any blemishes or pigmentation problems with the Colour Correct Concealer Palette (13.90). 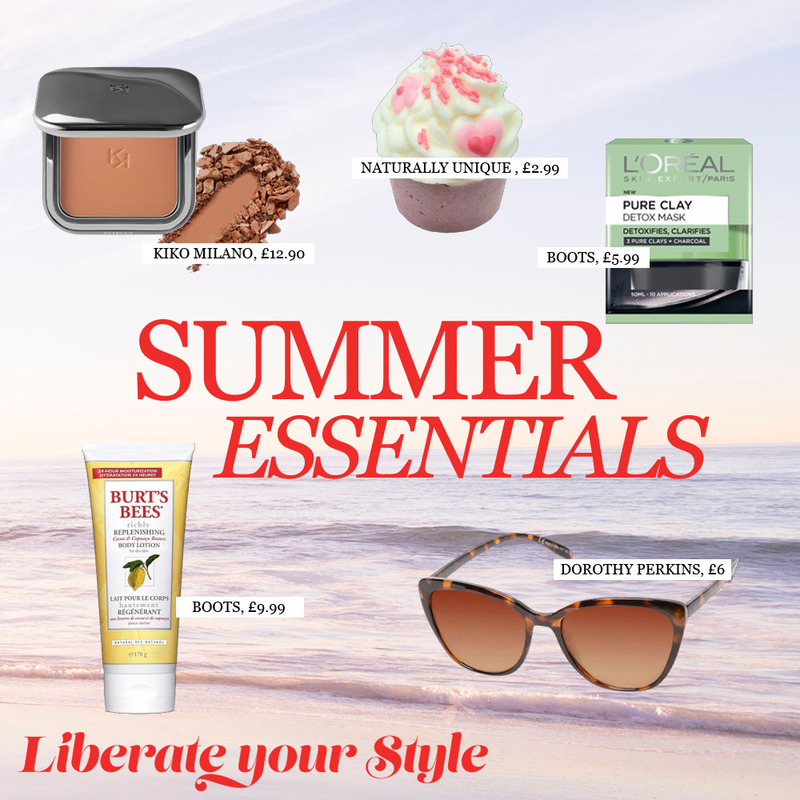 Next, build up your coverage with the Flawless Fusion Bronzer Powder (£12.90), finish your look with the Radiant Touch Creamy Stick Highlight (£9.90), a flick of mascara (from £2.95) and a slick of 3D Hydra Lipgloss (£7.90) for the ultimate effortless beach babe look. As the evenings lighten, so should your signature scent. It’s time to find your new perfume and the Perfume Shop is here to help you decide! So whether you prefer a light, fresh, floral or woody scent, head to The Liberty for a consultation with the in-store experts and discover your new go-to fragrance. The Liberty Top Tip: When buying perfume don’t be overwhelmed – spray a couple and leave the shop – perfumes develop differently on different skins and it’s important to understand how you will react to certain fragrances. Head to Costa Coffee or walk around The Liberty for a while and let your chosen perfume sink in and before you head home, snap it up! There’s no easier or quicker way to completely change an outfit than with accessories and with summer the best time to experiment with your look, there is nothing stopping you! It goes without saying that sunglasses are a must for any summer occasion and when it comes to sunglasses, we love having a selection of classic styles to match our mood. Dorothy Perkins Tortoise Cat Eye (£6.00) and Gold Flat Aviator Sunglasses (£8.00) are great options if you love classics – and with aviator and tortoise shell a guaranteed year-on-year – you will quickly see why these are investment pieces. The Liberty Top Tip: Selecting your perfect pair of sunglasses can be a complete ‘mare! You’ve got face shape, lens colour, fit and shape to consider so always try before you buy. With chokers still being the must-have accessory for summer, we can’t get enough of Claire’s massive selection and have already bagged our very own Leaf Charm Wrap Choker (£8.00). The perfect way to swing into festival season, this statement choker is the finishing touch your outfit needs. Finally, it is worth investing in an all-purpose set of sandals which will see you right through to the first chilly nip in the air, which is why we can’t get enough of Office’s Spiritual Cross Strap Sandals in Tan (£40.00). These are the perfect shoes for every conceivable summer event and we’re even considering indulging in the gold pair, too!